This morning at breakfast [1-egg up, rye toast, hot cocoa, jam] I watched the WWI movie, "All Quiet on the Western Front." This seems to be an anti-war story told from the German point of view. As I was walking back to Scampy from 24 Hour Fitness, my mind turned to food! There is one burrito in the fridge. I ate a burrito yesterday afternoon. Maybe I should treat myself out to eat? There is a Sizzler Steak House less than 4 miles distant. Yes! It's really great when the most pressing thing in my life is where to eat! This morning I listened to Rachmaninoff's Piano Concertos Numbers 2 and 3. This is such beautiful music. But on my MacAir, the music sounds low quality. Tinny. I've been considering the purchase of an Apple HomePod speaker. The reviews for HomePod are wonderful. But the price of $329 is not so wonderful. For $100 I am able to purchase a Bose SoundLink Micro speaker which has terrific reviews. I am kinda leaning toward the Bose. Click [Here] to listen to Rachmaninoff's Piano Concerto Number 2. Last nite the battery for my iPhone 7 went bad. The battery discharges very fast. I am able to use the iPhone by keeping it into plugged into electric power. However, the iPhone gets pretty warm until it gets to 100% charged. 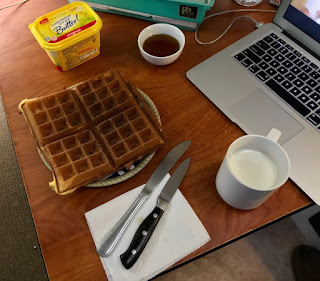 Somebody on YouTube made a comment about my Belgian waffle video and the comment came up on my Mac computer for approval. That's how I came to watch that video this morning. I got a kick out of viewing that Belgian waffle video. It was published on YouTube in September 2011. About 7-years ago when I was 74 years old. In the video, I'm wearing a shirt that is not tucked into my pants. Back then, I had a 37" waist and weighed 185 lbs. The shirt covered up the fact that my fat waist flowed over my beltline. Now I have a 32" waist and always wear my shirts tucked into my pants. My weight now is 160 lbs. Viewing the video got me to wanting a Belgian waffle for breakfast! I don't have that waffle maker anymore. It got lost in the accident that killed MsTioga in 2014. Now I have a Nordic Ware Belgian Waffler. Click [Here] my "How To Make A Belgian Waffle" video. At a Morning Camp on Kearny Mesa, I've been studying history by watching videos of professors lecturing on history. One video lecture that I particularly enjoyed was given by Professor Willard Sterne Randall about Alexander Hamilton. When I found this video lecture, I prepared breakfast and then watched the video. During my workout at 24 Hour Fitness this morning, I was thinking about the huge difference between my working life and my now life. Back then, the company that I was with during the best part of my working years was growing rapidly. My job was to purchase everything needed for the shop and office. Receive everything shipped to us. Supervise shipments of products that the company manufactured. Perform quality control checks. There was barely enough time to get this work done. My job was wonderful! Now, I am retired from my work. I have time to do anything that I wish. My challenge now is to have the insight to find things to do that stimulate and excite me all the while pacing everything that I do against my aging body. Oh, my! How I love all of it! My goal to become educated with my study of history seems to be going well. During the past few days, I've used the History Vault [Link] to learn about Confucious, Albert Einstein, and Michelangelo. Learning by using videos is much more exciting for me than reading a book. I never drift off to sleep watching these videos. While reading a book often puts me to sleep in minutes. The Scampy Team has been very busy today. ➜ We watched the last half of the movie, "A Bridge Too Far", which tells the story of the failure of Operation Market Garden which was conceived by British General Field Marshal Bernard Law Montgomery. Great movie! ➜ During breakfast, we watched the beginning of History Vault's "Story of Confucious." ➜ Filled both propane tanks and gassed up Señor Tránsito. ➜ Dumped Scampy's holding tanks and filled her fresh water tank. 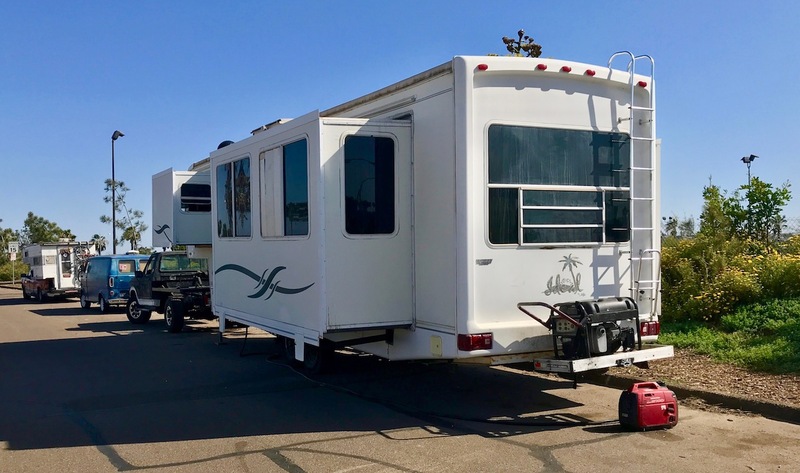 ➜ Visited Little Guy Trailers to see their Meer Kat trailer [Link]. I have three best friends. One of these friends is Evie, my former wife! Amazing, huh? A couple days ago Evie and I were talking on the phone. We were talking about our daughter Johana, who just found herself a great job. We both are so happy about that! Then our conversation turned to our own lives. Evie is 77 and I am 80 years old. Both of us are secure financially and are both doing what we want to do. We both agree that right now we are living our best days. This morning as I ate breakfast [1-egg up, 1-slice rye toast with raspberry jam, apple juice], the History Vault's story of the life of Samuel Clemens [Pen name -Mark Twain] played on my Mac computer. Mark Twain fascinates me. With no education beyond his 11th year, he managed to become a skilled Mississippi riverboat pilot. He worked as a journalist and author. Twain became a world traveler. He married Olivia with whom he had four children. They built a lovely home in Hartford, Connecticut. Twain became a wealthy man thru his writing and lost most of his fortune due to investments that went sour. Twain repaid his debts from earnings made by writing and lecturing. I find that I'm intrigued by all that Mark Twain did in his life. My life's goal is to be the best person I can be. Sometimes, I get off track. Hopefully, not for very long. I've signed up for the History Vault [Link]. Continuing my education is part of my life's goal. 24 Hour Fitness is part of my life's goal as well. I want to increase the depth of my workouts with cardio exercise. I've not been doing cardio exercise because, for me, it's not as much fun working out with weights. In order to take the "grind" out of my cardio, I plan to entertain myself with Audible Books. Recently I bought "The Cider House Rules" and "MASH" in Audible format. At the 24 Hour Fitness on Balboa Avenue, there are a lot of ladies working out. When I first began working out in the 1970s, hardly any women worked out. Curious, I asked some of the ladies in the gym club, why they worked out? Good health is very popular now, was the answer. Also, feeling good is a reason for exercising at the gym. Group classes are very popular with the ladies! 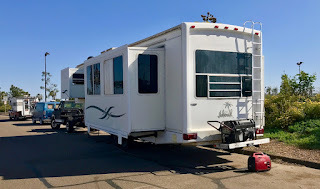 I've Blogged to you about how fantastic it is to be a street camping RVer in San Diego. RVers in the past have not had it so good because of strict law enforcement of camping on the street regulations. However, things have changed! Police still come around. However, for some reason, they stopped hassling RVers. Even in prime areas near the beach in Mission Bay. I have two RV friends, Nick and Natasha, who camp for a week at a time without moving. I spent a couple of hours this afternoon talking with them in the Rose Marie Starns South Shore Park. These two young people live in a Blue Bird school bus conversion. It's huge! Recently Nick and Natasha spent a week camping at Mariner's Point. Dozens of RVs camp there too. Of course, this is free camping! This 5th Wheel has all slideouts extended. Leveled out. Generator running. At South Shore. Recently I viewed two movies that resonated deep within me. Both movies brought up emotions that made me cry! "The Color Purple" tells the story of Celie, a young black girl living in the early 1900s. The movie portrays Celie's life when she is beaten down but in the end, after 30 years, comes out on top. "The Inn of the Sixth Happiness" is the true story of Gladys Aylward who knew that she was meant to live in China as a missionary. No matter what obstacles she met, Gladys persevered. It was the last of the movie that struck me! Where Gladys leads the children thru the mountains to escape the Japanese army. Click this [Link] to view "The Color Purple." Click this [Link] to view "The Inn of the Sixth Happiness." It used to be a challenge to street camp in the San Diego area. As late as a few months ago, I never observed flagrant disregard for No Parking/No Camping signs here. Over recent weeks, I began to see a few RVs Nite Camped in San Diego. They were here and there. Not many in one place. Then, suddenly over a day or so, the RVs street camping here boomed! And, a lot of these RVs are leveled out too! Dropping leveling jacks. Blocking up tires. I've been camping away from RV parks since I first bought MsTioga in 2003. Since then, I never observed anything like what is happening around here now. 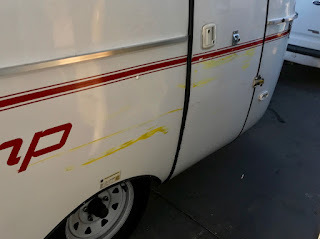 Readers have pointed out that the type of yellow paint on Scampy was not auto paint. This means that I sideswiped that yellow paint onto Scampy myself. The paint would have come from a pole. A 43" tall pole. Because that pole contacted Scampy's door lock. And Scampy's door lock is 43" above the pavement. If this is correct, then those paint marks had to be put on Scampy before I went into 24 Hour Fitness. Also, I would have had to miss seeing those yellow paint marks when I locked Scampy's door. The plan for this morning was to eat breakfast while watching a movie ["Flawless" with Michael Caine and Demi Moore]. Then, go workout at 24 Hour Fitness. When the time came to go to 24 Hour Fitness, the temperature inside Scampy was 82℉ and that was with the exhaust fan on. We would not leave Baby Boid inside Scampy with that temperature! Last Thursday I bought Endangered Species Dark Chocolate with 88% cocoa at a nearby Target Store. During that day I ate 4-squares. The following day [Friday], an unusual thing happened to me. I woke up around 8:30am. I'd slept for 9-hours. That is a very long time for me to sleep. Most often I sleep around 6-hours. During the nite when I used the bathroom and went back to bed, I fell back asleep immediately. Also unusual. A few days ago I blogged about wanting to see myself bald. Today I am going to get a haircut. Is this the day that I get a bald cut? No! It's not! But I am going to mention thinking about getting a bald cut to Tina, the lady who has been cutting my hair for several years. I'm very happy and to be back in San Diego. This area is comfortable for me. We are close to the Ocean, especially Mission Bay Park which has a Dump Station at the South Shores boat ramp. Our preferred Nite Campsite is quiet for sleeping. My favorite 24 Hour Fitness Club is here. My friend John P. lives here! The main thing that I learned from our recent Forest Camp was that I should never drive Señor Tránsito in a place where his front wheel drive weakness is tested! Also, it's too cold up there at an elevation of near 6,000 feet at this time of year. The Scampy Team would be much better off to do more research about future camps in the forest. We did not need this kind of research when MsTioga was alive. But now, with the Scampy Team, we do! Tioga, I do not need to test myself like this anymore. It's kinda hard to find Nite Camps near Idyllwild. So, we went searching for someplace higher in elevation where the forest has lots of trees. We found Dark Canyon campground off State Highway #243 in the San Bernardino National Forest and went to take a look. As we entered the road down to the campground, we found that the roadway was very steep. Immediately I became concerned that Señor Tránsito would not be able to pull Scampy up out of Dark Canyon! This road is much too narrow to turn back. So, we continued on. During the evening, I went over in my mind what the best course of action would be to get Scampy out of the canyon and back up to State Highway 243. I planned to leave Scampy in Dark Canyon Campground and go find a tow truck. We made last nite's Nite Camp on a dead end street behind a car dealer. This was a very quiet place for sleeping. Gotta love it! Before heading out from Temecula this morning, we want to top off our fresh water tank and 3-gallon drinking water bottle.